Lightness is always an asset when climbing. I’ve always found that my time out in the hills is much more pleasurable if I’m not weighed down with heavy gear. That applies as much to a gentle walk through the woods as it does attempting a a new summit. 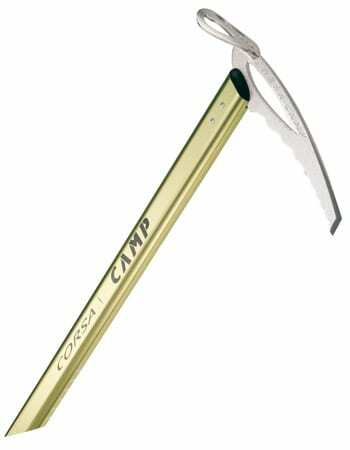 If you are looking for the lightest ice axe or can afford a quiver of axes, then the Corsa great to have. It self arrests smoothly and is strong enough to use as a snow anchor, which makes it useful for more than just ski mountaineers and early season hikers. It is a poor choice to climb steep snow or beat on pickets with. On paper having the lightest ice axe can be quite useful but it also has some disadvantages. The main one is durability. Aluminium is naturally softer than steel so this will take a real beating on mixed routes. I wouldn’t think this would be best for Scottish gullies and similar routes where there is a lot of rock in with the ice. The other downsides to this are that it has a really small adze so you can’t do a lot of step cutting and similar chopping. It also doesn’t have the balance with extra weight on the head for all-day swinging. It also doesn’t have a proper spike. Instead the shaft is just edged and hollow and you just drive the whole thing (although it does have a little plug to keep snow out). In short if you are doing ski mountaineering, glacier crossing and value having an ultralight ice axe for competitive reasons then this would be a decent choice. If you are buying your first ice axe or are looking for an all round mountaineering ice axe then I might look at something like the Raven Pro first.